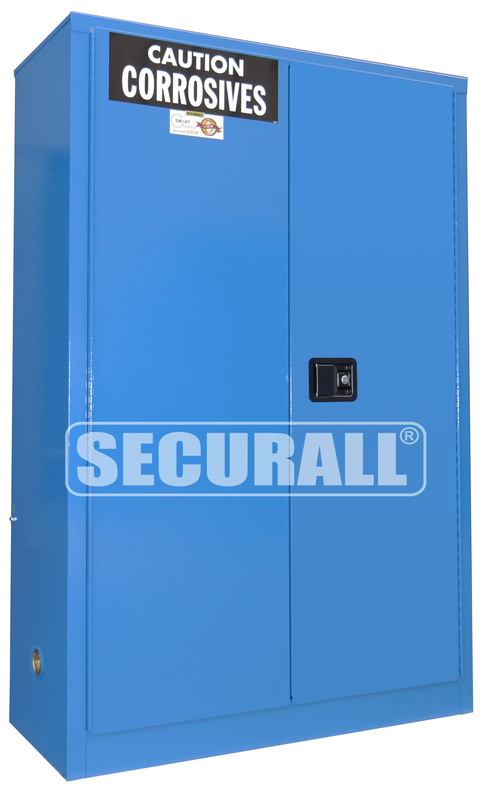 Keep all acids safe and at hand with Securall Flammable/Corrosive storage cabinets for both flammable and nonflammable corrosives. Available in 24, 30, 45 and 60 gallon capacities. 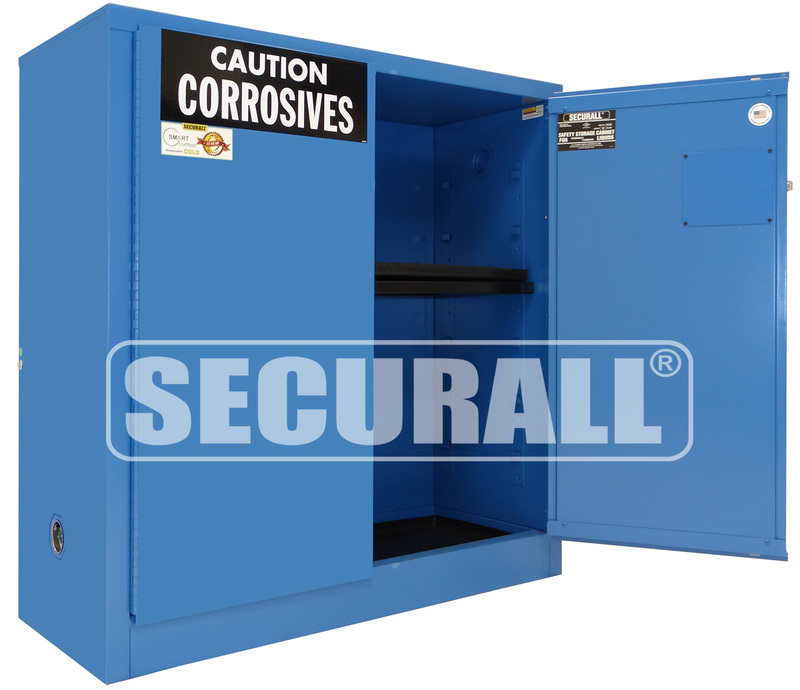 Keep all acids safe and at hand with Securall Benchtop Flammable/Corrosive Storage Cabinets for both flammable and nonflammable corrosives. Cabinet has a ¾" leak-proof tray top, which can completely contain a 5 pint spill. 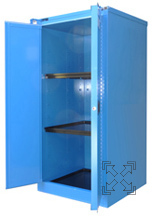 Cabinets finished in blue corrosive-resistant urethane. Adjustable painted galvannealed steel shelves and bottom lined with removable polyethylene trays; tray-top cabinet lined with removable polyethylene sheet. C124 - Self-Latch Standard 2-Door; Shelves 1; Dimension 36"H x 35"W x 22"D; Approx. Ship. Wt. 207 Lbs. C224 - Self-Close, Self-Latch Sliding ; Shelves 1; Dimension 36"H x 35"W x 22"D; Approx. Ship. Wt. 212 Lbs. Approx. Ship. Wt. 82 Lbs. C130 - Self-Latch Standard 2-Door; Shelves 1; Dimension 44"H x 43"W x 18"D; Approx. Ship. Wt. 270 Lbs. C230 - Self-Close, Self-Latch Sliding Door; Shelves 1; Dimension 44"H x 43"W x 18"D; Approx. Ship. Wt. 275 Lbs. C330 - Self-Close, Self-Latch Safety-T-Door; Shelves 1; Dimension 46"H x 43"W x 18 Inch; Approx. Ship. Wt. 290 Lbs. C145 - Self-Latch Standard 2-Door; Shelves 2; Dimension 65"H x 43"W x 18"D; Approx. Ship. Wt. 363 Lbs. C245 - Self-Close, Self-Latch Sliding Door; Shelves 2; Dimension 65"H x 43"W x 18"D; Approx. Ship. Wt. 368 Lbs. 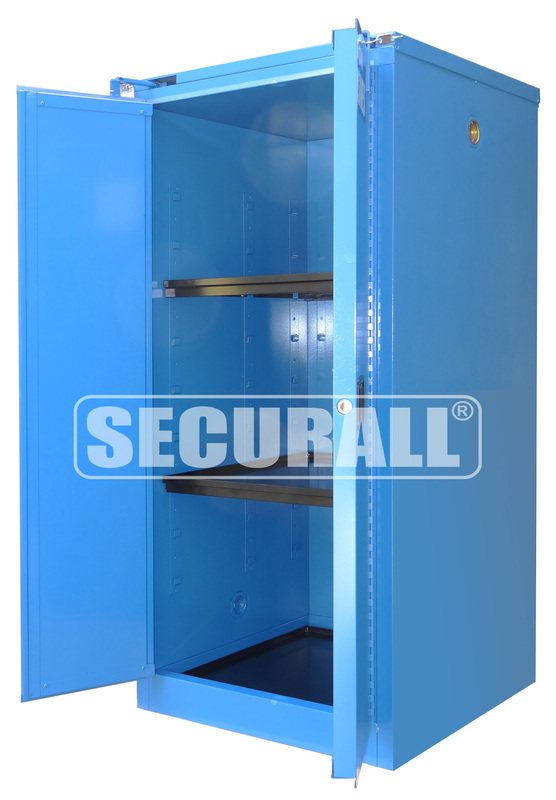 C345 - Self-Close, Self-Latch Safety-T-Door; Shelves 2; Dimension 67"H x 43"W x 18"D; Approx. Ship. Wt. 383 Lbs. C160 - Self-Latch Standard 2-Door; Shelves 2; Dimension 65"H x 31"W x 31"D; Approx. Ship. Wt. 396 Lbs. C260 - Self-Close, Self-Latch Sliding Door; Shelves 2; Dimension 65"H x 31"W x 31"D; Approx. Ship. Wt. 401 Lbs. C360 - Self-Close, Self-Latch Safety-T-Door; Shelves 2; Dimension 67 x 31 x 31 Inch; Approx. Ship. Wt. 418 Lbs. 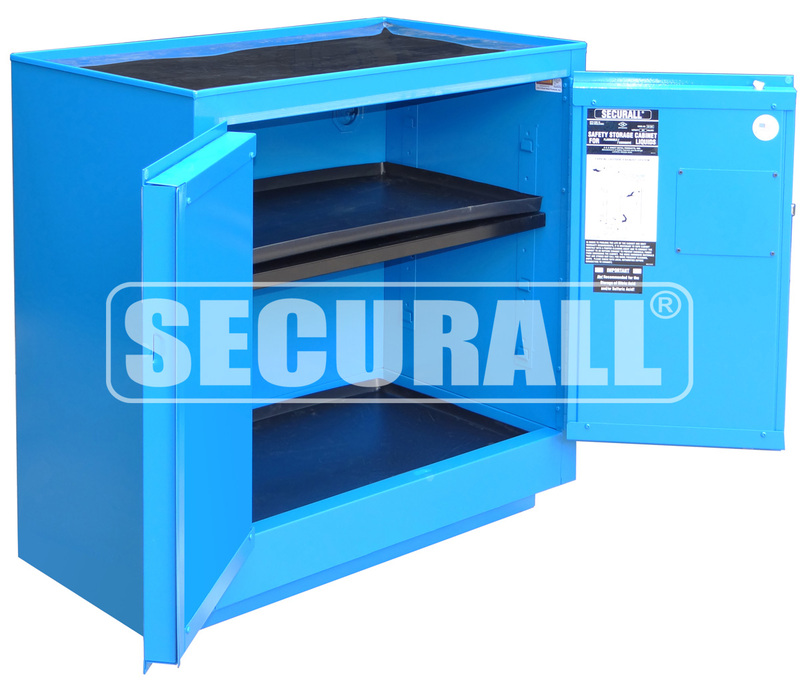 Blue polyethylene cabinet is designed to fit inside an Acid/Corrosive Safety Cabinet or to be used as a countertop cabinet. The one-piece body is constructed of high-density (.187" thick) polyethylene allowing the cabinet to safely store acids and corrosives near your work area (including nitric and sulfuric acids). Double-wall recessed doors help to control vapors. Fit two cabinets in a 30 gallon cabinet or three in a 45-gallon cabinet. Labels read, "ACIDS/CORROSIVES" and display the international symbol for Corrosive Material. Shipped assembled and ready to use. 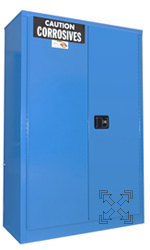 PE3045 - High Density Polyethylene cabinet for storing harsh acids; Dimension 18 x 38 x 13 Inch; Approx. Ship. Wt. 32 Lbs.